The Friends of Galileo is a friendly, family-oriented club of astronomy enthusiasts in Longview, WA. We are dedicated to advancing the understanding & enjoyment of astronomy through educational programs, practical experiences and social events. You don't need your own telescope to join! We have star parties, sidewalk astronomy and guest speakers (local and internationally-known experts). Members share responsibility for operating the club, participate in social events, and can even borrow various club telescopes. Membership dues (payable in early May) are modest and cover your immediate family. We love to share our wonder and knowledge of the sky! Members include all ages, from beginners to experienced viewers. Some are telescope makers and astrophotographers. We have teachers, millworkers, homemakers, doctors, students and retirees. You'll fit right in! Oh, and check our Galileo page for a short bio of the first astronomer to use a telescope. We've met monthly since 1995. Join us! Visitors are always welcome to take part! Check our Calendar page for dates and times. Contact us for your first visit, in case of last minute changes. Our meetings generally include sky reports (what we can see this month), club business, guest speakers, and light refreshments. It's a great way to meet fellow sky enthusiasts. Just getting started in astronomy? You'll find friendly club members to provide tips and advice. 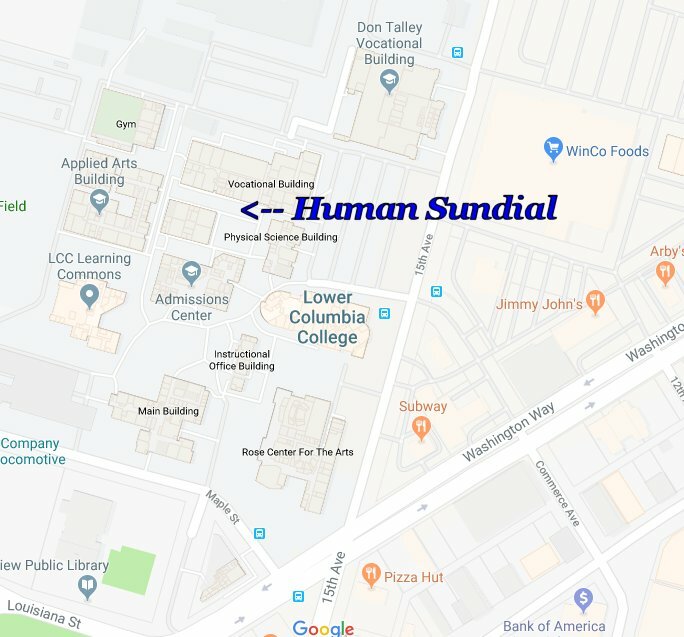 We meet at Mark Morris High School, either in the Large Group Instruction Center or in the physics classroom, Room D8 (see map detail, upper right). September through May: meetings start at 7:00 p.m. on the third Wednesday of each month. From time to time, members will bring their telescopes to the sidewalk outside Starbucks on Ocean Beach (just west of Harbor Freight). Come by, say hello, and have a look at the sky! Check our Events page for the next date. 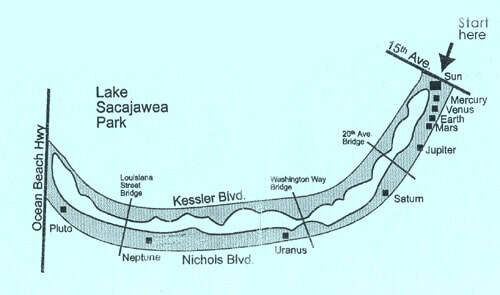 Did you know we gave the City of Longview a scale model Solar System Walk, along the west side of Lake Sacajawea? That was in 2001. In 2018, our very first Solstice Lantern Walk through the Solar System was a spectacular success. Help us light up the longest night of the year! Stand in the right spot, and your shadow will tell you the time! This is another club gift to Longview. It is outside the Science Building at Lower Columbia College. Stephen Powell describes the creation of the sundial. What's the weather forecast for Longview? Check accuweather.com or weather.com. Will we have a clear, dark sky at Willow Grove Park? What can I see in the night sky this month? When will the International Space Station be visible from my house?